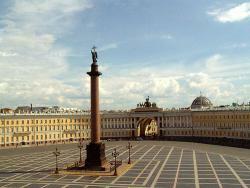 Palace square is the main square of St. Petersburg. It is the center of the city. The ensemble of Palace Square was formed in the middle of the 19th century. The main structures of the square are the Winter Pal­ace, the former General Headquarters building, Alex­ander Column and the Guard Headquarters. The Winter Palace was built as the residence of the Russian monarchs. It was designed and constructed by the architect Bartolomeo Rastrelli in 1754-1762. The palace is a fine example of Russian baroque. Today the rooms of the Winter Palace house the collections of the Hermitage. There is a grandiose building opposite the Winter Palace. It is the former General Headquarters build­ing. It was built by the architect Carlo Rossi in 1812- 1829 in the classical style. There is the Arch of Tri­umph in the middle of the building. It is a monu­ment to Russia’s victory over Napoleon in the war of 1812. It is decorated with compositions of ar­mour and figures of the genii of Glory. The Arch of Triumph is crowned with six horses bearing the winged figure of Glory. The sculptures were created by Demuth-Malinovsky and Pimenov. The former Guards Headquarters were built by the architect Bryullov in 1837-1843 in the style of late classicism. In the center of Palace Square Alexander Column is rising. It was installed to commemorate the victory over Napoleon in 1812 in the Patriotic War and in foreign campaigns of the Russian’s Army of 1813 and 1814. Alexander Column was erected after the design of Auguste Montferrand. It took three years to deliver the shaft of the column from a cliff in one of the bays of the Gulf of Finland. The weight of the monolith was 704 tons. It was brought to St. Petersburg in a barge. More than 2,000 soldiers and 400 workmen rolled it onto a high platform. Then they lowered it onto its pedestal. The column was made of dark red granite monolith. The column rises to the height of 47.5 meters. On the top of the column is the bronze figure of an angel with a cross symbolizing peace. The figure of an angel was executed by sculptor Boris Orlovsky. The face of the angel is a portrait likeness of Alexander I in whose reign the victory over Napoleon was won. The bas-relief on the pedestal was made by the sculp­tor Peter Svintsov and Ivan Lepper. On the bas-relief facing the Winter Palace, the Allegories of the rivers Neman and Visla surrounded by ancient Russian suits of armour are depicted. The western bas-relief facing the Admiralty presents Justice and Mercy. The south­ern bas-relief presents Glory writing on the tables the dates 1812, 1813, 1814, 1815 and Peace. The eastern bas-relief presents Wisdom and Abundance. Alexander Column was inaugurated at a grand cere­mony on the 30th of August in 1834.